The gold standard for skin cancer treatment is surgical removal. Since the best treatment is surgical, doesn’t it make sense to have a plastic surgeon treat your skin cancer? Although there are many types of physicians who treat skin cancer, the best physician to cure and reconstruct skin cancer is a Plastic Surgeon. Dr. Viggiano, a Board Certified Plastic Surgeon, has been trained to not only diagnose and cure skin cancer (without the need to resort to time consuming and expensive Mohs Surgery), but to reconstruct the tissue that was lost. From the simplest removal and fine line scar closure to rebuilding a nose, an ear, or an eyelid, Dr. Viggiano knows the latest techniques to make the experience low stress and to provide the most aesthetic result possible. Reconstructing the lip for cancer may require a wedge removal of the cancer with closure. 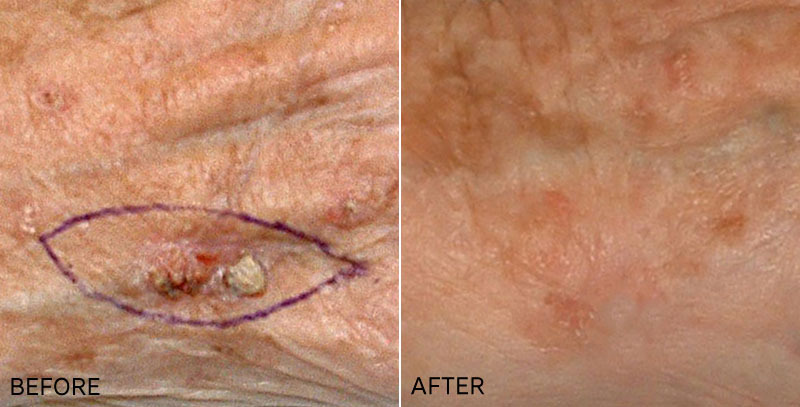 Direct closure with stitches of the defect following skin cancer removal is the gold standard treatment and usually heals with an excellent scar. Rebuilding the lower lid can be performed using nearby skin from the temple. Reconstructing the upper eyelid can be performed using skin as a graft from another area. Reconstructing the nose can be performed by advancing skin from above the defect. Great experience! Dr. Viggiano and his staff are professional and have the best interest of the patient in mind. I... Great experience! Dr. Viggiano and his staff are professional and have the best interest of the patient in mind. I felt very comfortable with the procedure performed. Everyone is so nice! Why should I have my skin health examined by a professional? When should I see Dr. Viggiano for a skin checkup? Why does it take so long after exposure for the skin cancer to develop? Why does ultraviolet light cause skin cancer and the color near it in the spectrum, violet light, does not cause skin cancer? I have been treating skin cancer for over three decades, and usually can tell when a skin change is cancerous, but not always. A typical skin cancer is a growth (a bump) that is new and growing. It often will eventually bleed as it gets larger. Careful towel drying after a shower may allow the cancer to heal enough to stop bleeding, but it bleeds again. Being born with dark skin can protect one from the harmful effects of sun exposure. This is not the same thing as getting a tan for a person who was born with lighter skin. Think of a tan as the body’s way of attempting to protect you from injury. In order for this to occur the body has to experience an injury. Sun damage injury is permanent and causes skin wrinkling, dark spots, and skin cancer, yet a tan is temporary. Since skin cancers typically take 30 to 40 years to develop, any sun damage you got years ago may show up later in life as wrinkles, dark spots, and skin cancer even if you no longer spend much time in the sun. Dr. Viggiano has often seen patients presenting with a concern about a particular spot that turned out to be benign, but on careful examination a different area that the patient hadn’t even noticed turned out to be a skin cancer. It takes an expert eye to determine what is suspicious and what is not. Having an annual skin check by Dr. Viggiano can be a valuable way to protect yourself. The best defense against skin cancer, and sun damaged skin, is sun protection. You can’t change the past but you are in control of your future. Protecting your skin with sunscreen, clothing, and a hat is essential. We carry a full line of prescription and non-prescription skin care products to reverse the damage caused by past exposure to the sun. We also carry excellent sun screens to protect your skin. Anytime a new skin lesion develops, there is a possibility that the lesion may be a new skin cancer. Keep in mind that some new lesions may not be cancer, so there is no reason to worry solely due to the fact that a spot on your skin is new. Still, any new or changing spot should be checked by an experienced physician. Trying to determine whether a lesion is cancerous or benign by yourself by looking at photographs on the internet is not possible. Only after seeing many lesions (Dr. Viggiano has examined thousands of people during his career, seeing many thousands of lesions) can one have a reasonable chance of determining if a lesion is suspicious or not. Skin cancer treatment is a large part of Dr. Viggiano’s practice and because of this he does skin cancer screening on his patients. If you have something new on your skin, undoubtedly Dr. Viggiano has seen similar lesions many times. He can help you by diagnosing and treating any problem spot you may have on your skin. Because skin cancer is caused by exposure to the sun’s ultraviolet rays many years before the skin cancer occurs, it has been difficult to convince the general population sun exposure was the cause. Most skin cancers develop in people who are older, at a time in which they are getting little sun exposure. For the most part, children spend more time out in the sun than adults, yet it is rare for a child to get skin cancer. This delay has caused confusion. Ultraviolet light causes damage to the DNA of the living cell in the skin. If the damage is severe enough, the cell dies. We see this as peeling and blistering of the skin. If the damage is less severe, the DNA is permanently damaged but the cell does not die. This damaged cell, with its permanently changed DNA, gives raise to daughter cells which also have the altered DNA. Over many generations, and with additional DNA damage, the daughter cells may show the effects of the damage by changing their pigmentation (sun spots) or causing cancer. The change in color can occur in years. In children, we see this as freckles even in 5 year-olds (no one is born with freckles, they are always sun damage). It takes 20 or more years for skin cancer to develop. Light propagates in packets called photons. A photon of violet light has more energy than a photon of red light. When the violet photon hits an atom, it gives its energy to an outer electron. The energy transferred to the electron is insufficient to knock the electron completely from its atom. It jumps to a higher energy level and then releases its energy and returns to its original position in the atom. Ultraviolet light is the threshold in which the photon now has enough energy that the electron it hits receives enough energy to a its parent atom completely. An atom that has lost an electron has been ionized (ultraviolet light is ionizing radiation much like x-rays and gamma rays). Ionized atoms are unstable and will react chemically to nearby atoms. Random chemical reactions in the complex reactor that is the human body is dangerous occurance. The particular reaction that causes the DNA damage occurs when one of the two thiamine bases that happen to lie together in the DNA molecule ionizes. The reaction could then be a fusion of the two thiamine bases into a stable thiamine-thiamine dimer. Once this occurs, the daughter cells and all their subsequent generations get a poor copy of the DNA. A permanent mutation has occurred.